Morag Malloy was a late starter in enterprise, but right from the birth of her brilliant branding business she’s aimed for the top. She’s legend for her love of a lighter shade of pale. A real tangerine dream. Morag Malloy, founder and MD of digital branding and communications business Fission Creative, might be small in stature, and have a particular penchant for the colour orange, but this is one woman punching well above her weight in the world of digital communication and branding. From the very formation of Fission, in 2009, Morag was thinking big. With a substantial design management CV, and years of managing marketing accounts behind her, she wasn’t one to buy into the “start small” school of business beginnings. But Morag was a late developer when it came to burning entrepreneurial drive. It was being made redundant from a major design agency which forced her to rethink the future. At 41, with her family complete, and the security of the 9-5 gone, it became clear that Mo should go solo. A flurry of Business Gateway workshops made it crystal clear that the initial plan of running a creative consultancy couldn’t cut Morag’s mustard. She just didn’t feel the love, get the buzz, the personal development, or the income, to satisfy body and soul. To the relief of her Business Gateway adviser, her enterprise eureka moment eventually arrived, consultancy was canned and the branding and design business that is Fission Creative came hurtling off the blocks. Morag sped straight into limited company status in the creative sector, registered for VAT and applied some big thinking to her business ambitions. Unable to bring her contacts book and clients with her from the world of work, she knew she had to be far more than just the microcosm of Morag. No small fry for solo Mo – from the very beginning she aimed high, went for big clients and cracking creative contracts. Being joined by husband John soon after start up wasn’t really part of the Fission business plan, but when he too got laid off, it made sense that he brought his substantial skills set to the party. Between them, Morag and John have made Fission a force to be reckoned with in the fast flowing digital age. The BBC, Unity Contract Finance and the Professional Publishers Association are amongst a large client group getting the fantastic Fission marketing, branding, design and digital treatment – the company’s creative CV certainly commands respect. And these days, Morag’s definitely got the business buzz. Her enterprise excitement is palpable, especially now that Fission has four wonderful workers on its books, with more in the pipeline. Being responsible for staff is something Morag takes very seriously – the heady days of mass employment in the creative industries is long gone – so her ambitions focus on exponential expansion and realistic growth. Morag makes special mention of the superb support Fission Creative has received from Invest in Renfrewshire to create new jobs – without their help growth would have been much, much slower. And on a personal level, she loves the support and kinship shown from fellow members of the Scottish Women in Business network. As for solo Mo herself? Five years in, and she feels she’s finally not too far from being on track with the business plan. The duality of running a branding business and being her own business brand is the perfect fit for this refreshing Renfrewshire businesswoman. She certainly wears her own brand beautifully. 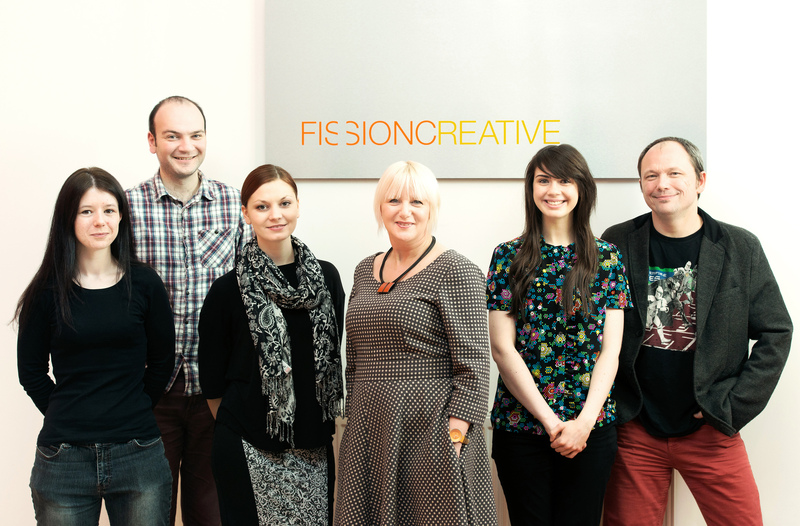 For Morag Malloy and Fission Creative, the future is bright, the future is orange.